Can you you feel the bass and guitar kick in, and hear the tempo surely rise? I knew that you could! Everything you ever wanted to know about the state of syndication on UMW Blogs for the low, low price of my overdrawn prose. So lay it down and start kicking it up a notch–if you ain’t syndicatin’, you ain’t vindicatin’! 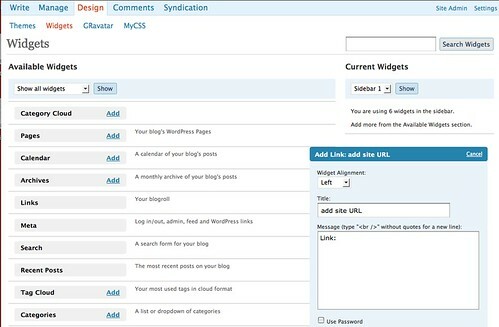 FeedWordPress Syndication plugin that is at the heart of the re-publishing posts from blog-to-blog. particularly when re-publishing a students posts in a course aggregating blog. Sitewide Tags Pages Plugin This plugin automatically re-publishes all public posts from around your WPMu environment within a single blog. Which, in turn, gives you access to sitewide tag and categories feeds in one place, as well as a sitewide search of public posts. Note: only works with dynamic subdomains last I checked. cets_EmbedRSS This plugin simply allows you to publish RSS feeds within a page or post without hacking the theme template (which until recently was a necessary evil). 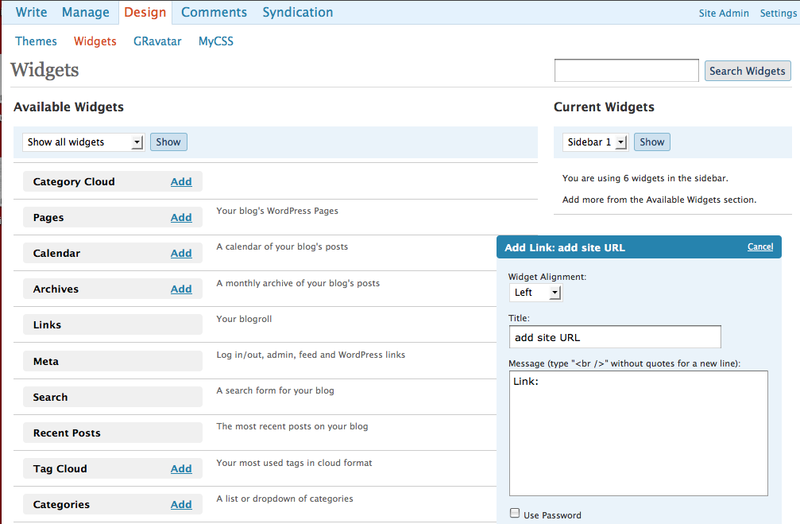 Now, it is in conjunction with the Sitewide Tags Pages plugin that FeedWordPress plugin can become quite powerful. 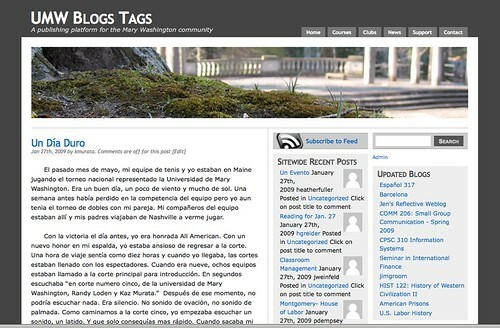 Once you have an agreed upon tag (or category), you can activate the FeedWordPress plugin and add the feed for a specific tag like prisonlit (http://tags.umwblogs.org/tag/prisonlit/feed) to an aggregating course blog. After that, every post published on the students blogs with that tag will be automatically re-published on this course aggregating blog. Additionally, all of the actual post title (a.k.a. permalinks) will link back to the students orginal post on their own blog. 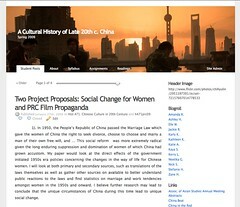 For example, in Susan Fernsebner’s A Cultural History of Late 20th Century China course blog every students’ post is being fed in through FeedWordPress by way of a unique, sitewide tag the class decided upon. Also, the title of each post links back to the actual student’s blog. 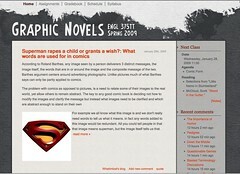 With such a setup the class members and professor can simply subscribe to the course RSS feed and have all the posts for that class delivered to their RSS reader through a single feed, and each of the titles within the reader will link back to the student’s post on their own blog, rather than the course blog. What we have here is a lightweight, powerful mechanism for collecting posts from around the environment in one place and filtering them by tags and/or categories by means of the Sitewide Tags Pages plugin, while the FeedWordPress plugin allows for easy re-publishing of a filtered tag or category within a unique course space which results in a series of aggregated of posts relevant to the course. Now, what if you aren’t blogging on UMW Blogs, what if your a Blogger baby or a WordPress.com commie or a Drupal droid? What if you are a roll your own kinda gal? Does this mean you are out of luck? Of course not, this is UMW Blogs after all, we don’t discriminate, we just filter. And that is the kicker for me, so if you activate FeedWordPress on the actual sitewide tags blog—or on any specific course blog—you can simply add an external feed coming from another service (right now I have tested FeedWordPress with Blogger, WordPress, WP.com, TypePad, and Drupal—all work cleanly) and the posts will syndicate into the course blogs cleanly with the relevant tags or categories. And if you activate and palce the Add Link widget in the sidebar of a course blog or the tags blog, students could simply drop off the URL of their own blog on some other site or service, and it would integrate smoothly. How about that? Is this eduglu? Wants some examples of this? I have a couple. Zach Whalen is hosting his courses on a Drupal installation he both designed and manages, it has some impressive features and the students all have their own spaces on a Drupal course site like this one. To bring the posts from this course into the UWM Blogs fold, all we need to do is add the feed for the Drupal course into the FeedWordPress plugin on the UMW Blogs Tag Site. That way, all the posts my the students on professor Whalen’s site will be visible and searchable on UMW Blogs. Professor Fernsebner’s Toys as History Seminar is an example of the fact that there are a number of ways to handle aggregating posts by students in a course blog. She is not using FeedWordPress for this seminar, and while all the students are still tagging their posts with a unique tag, they ar being fed into a separate page on her course blog using the cets_EmbedRSS plugin. 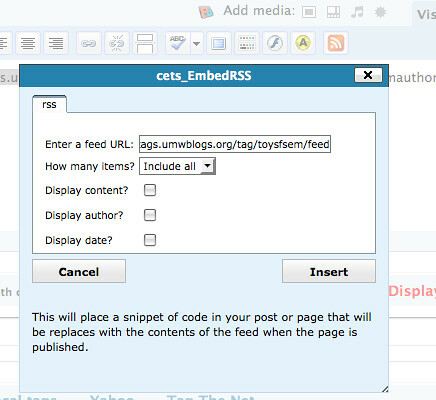 So, if all the students are tagging their posts toysfsem, for example, she would simply activate the cets_EmbedRSS plugin, create a new page, and click on the RSS icon in the visual text editor. From there she adds the following feed: http://tags.umwblogs.org/tag/toysfsem/feed And all the posts tagged with toysfsem will be aggregated into this page, including the student blogging from WordPress.com whose feed was added to the UMW Blogs Tag site. 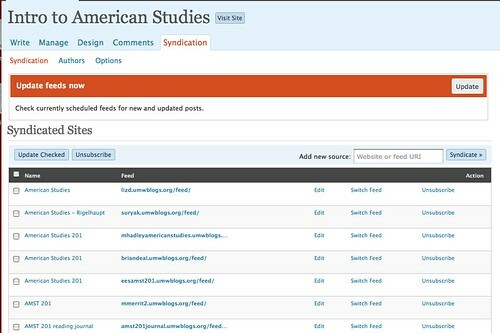 Additionally, you can simply activate the feedWordPress plugin and Add Link widget and have student drop off their feeds for where they are blogging. And, what you have here is a self-service model for syndication, wherein the students become responsible for the feeds they add, and for actually thinking about the implications of writing for several courses from one space, as well as framing the site to work within these parameters. The thinking about the actual process of syndication, organization, and managing one’s own space is actual a key feature to this entire model. I don’t think it should be shied away from at all, but rather embraced. As you might have gathered if you made it this far (you self-loathing hippie, you! ), I’ve been trying to work through as many angles as possible with this stuff. This post is fodder for a bunch of documentation I will be building for faculty at UMW for creating syndication based courses on UMW Blogs. We have a surprising number of over 30 courses using some kind of syndication setup this semester, and it is high time we documented the hell out of it. I’ll also note here that BDP RSS, the plugin that started me down the aggregation/syndication path, has been retired on UMW Blogs. The combination of cets_EmbedRSS and the Sitewide Tags Pages plugin made this plugin somewhat redundant, but to its great credit it hasn’t been updated for over a year but still works fine in the latest versions of WordPress and WordPress Mu. This entry was posted in WordPress, wordpress multi-user, wpmu and tagged aggregation, bdp rss, drupal, faculty, feed, feedwordpress, Plugin, plugins, sitewide tags, syndicating, syndication, tagging, umw, UMW Blogs, umwblogs, widgets, WordPress, wordpress.com, wpmu, wpmued. Bookmark the permalink. Jim, I’ll say my same refrain again, you are truly a superhero! Thanks for publishing this, and continuing to write about the incredible work you’ve done on UMW Blogs! Although there are a lot of great higher ed WPMU installations out there, UMW Blogs has totally been our inspiration. Without your work and your sharing, Blogs @ Suffolk University wouldn’t exist today! Great post. I have a love/hate relationship with Feedwordpress though. I hope we can get it to work well with our environment(creates users which could conflict with our SSO) or find an alternative… cets_EmbedRSS I had no idea this plugin existed will be very useful. As you can see OLT is spying on and stalking you. The proper syndication and aggregation is the Achilles’ heel of our WP implementation. I am not confident about FeedWP. It started to act weird out of the blue and Scott and Enej spent the long hours trying to fix it with little success. I am hoping to to have either stand-alone syndication and aggregation server (perhaps the undead aggRSSive), or to use Google’s Ajax playground. Scott did some research around it (Feeds API), and looks good so far. In fact, if truth be told I’m the one who is stalking you, and the AJAX playground sounds interesting to me, and while I am a fan of aggRSSive, I actually think a stand alone app for this may present its own set of headaches and issues, WP needs to build something like this into the core, in my opinion it is key. I’m trying to make sense of this process. I have the tag-posts, post-indexer and TagsBlog (Global Posts) set up. I have Feed WordPress set up. How do I get those tag-specific feeds with links back to the original Posts into the page with cetsEmbedRSS? This lets me enter a new feed, but doesn’t seem to have anything to do with Feep WordPress? I feel like I’m almost there! They way to get the sitewide tags to feed into a specific blog is to activate FeedWordPress on the blog you want to aggregate the posts into. and that you are using dynamic subdoamisn, it will still work with subdirectories, but the url has to change accordingly.